I have finally joined on the peppermint party, maybe a little late. I wanted to make Gina's Chocolate Crinkles, because they are so good. Such a coincidence that her post for these cookies last year was titled "Chocolate Crinkles for the Grieving" for an Uncle who had past away. Little did I know that there would be a horrific event in Connecticut, that has shaken our nation, and so I made these cookies for comfort. I was home by myself Friday, as the events in Newtown unfolded. Shaken to my core, the only "person" I could hug was Bailey, the Wonder dog. I kept thinking that my kids who are grown adults in their 30's, were so fortunate that they never had to face any crisis like Newtown, and could go to school unscathed. Now the world is a very different, scary place at times. Remember your good times, and hug your kids and your dog today. Good will overcome the bad. I did decide to change up the Chocolate Crinkles by adding the Peppermint Kisses. 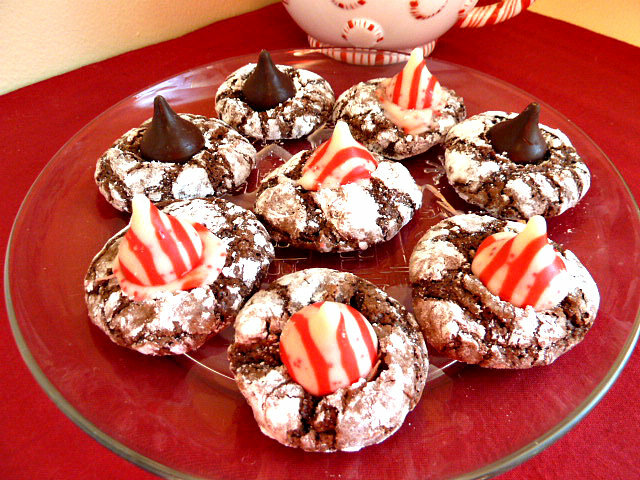 After the Crinkles baked, I didn't realize, that because the Peppermint kisses weren't milk or dark chocolate, so they would melt into the cookies, like the ones in these pictures. 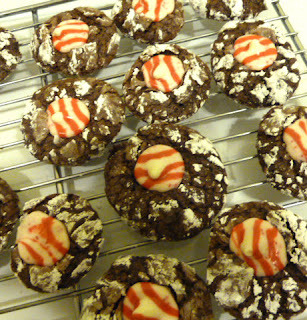 I had to add another kiss on top of the melted, so those cookies have a double dose of Peppermint. when I ran out of Peppermint Kisses, I added the Dark chocolate Mint kisses, which, worked perfectly. Now, these cookies look better. 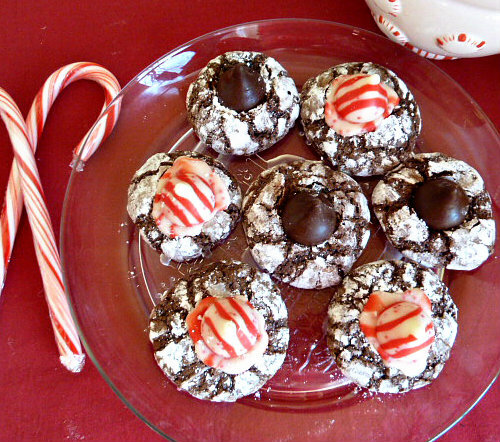 These cookies are a chewy chocolate cookie topped with the cool peppermint, so good and perfect for the season. Mix in one egg at a time until well combined. Add vanilla. Sift the flour. Add flour, baking powder and salt into mixture, mix until well combined. Chill the dough at least 3-4 hours. Oil your hands and take rounded teaspoons full of dough and roll into a ball, and then roll the balls in powdered sugar. Place balls onto a parchment lined baking sheet, 2 inches apart. When cookies are done, Cool on cookie sheet 2 minutes. Remove to cooling rack; After three minutes, place a kiss in the center of the cookie, and press down. lightly. Continue to cool on rack, until candy is set. Cooks Note: I made smaller 1” cookies, and I got about 48 cookies. Oh, yeah, I had those melty peppermint Kisses with my first batch this year, too! Thank goodness the kids didn't care and ate them anyway...but not the best to show on the blog :) Merry Christmas, Becky! Now we know about those melty peppermint kisses, so if we use them again, we'll know what to do with them. I must admit, Becky, that in taking the kids to school on Monday, I wondered for a moment if it would be the last time I saw them... Your lovely cookies would definitely bring comfort with the minty, festive colors. I had a baking mishap last year with the peppermint Kisses, an entirely different cookie and recipe, but it was a melted mess like Frosty the Snowman in the sun. Trial and error will give way to success, right? Season's Greetings to you & yours! You, Lizzy and I belong to the melty Peppermint Kisses Club, and not by choice:) You are certainly right about trial and error. Chocolate and mint make such a delicious combination, and your cookies are just so cute too! Thanks, I love the chocolate peppermint combo, too. Thank you so much for sharing these delicious cookies with me. I bought a bag of those kisses, but they got eaten before I could make anything with them, lol. Your cookies sure disappeared fast around here. Thanks again.